“You could call it an outcome of some ‘Out-of-the-box’ thinking that had crept into my mind maybe when I was in my 7th standard, maybe before. I do not remember all that precisely, it was in my childhood and I can’t give it any age. I had this keen fascination for electronic stuff for as long as I recall, from the time when I was just a small kid. I would open up things to find out how they worked. During one of my summer vacations, I got an idea to seriously and systemmatically start learning about electronics – I guess it was around the time when I was in my 5th standard. I came to this institute near my house, primarily because it was very accessible for me, and I started taking up classes – very soon my interest in electronics grew into reality. Gradually I learnt to make out how things actually work and what happens exactly inside electronic gear. By the time I was in my 9th I was a lot more aware of electronics, I had enough confidence to prepare electronics projects for inter-school competitions, of which I won several. My schooling, apropos, was from the Bal Bharti School near Ganga Ram Hospital. “In appreciation of my enthusiasm, my school gave me a laptop and also paid for my internet – it was their way of enabling me to do even better. I did, and by the time I reached my 11th class, I had already tried out everything that were in the books, and knew what people across the world had done in electronics until then – a growing urge was taking shape in my mind, to use my skill-sets and do something as yet unexplored … I pondered on it, and once I had a workable idea in my mind, I confided in my dad – described my idea to him and set out the details of all the stuff for which I needed money. My dad, he did not even think about it, he just said ‘okay, go ahead and make it’. “It was in 2014 when discussing robotics in real life that we at A-SET got a thought – ‘why isn’t it that we do not yet have robots around us to do tasks?’ The answer was simple – robots today were too costly. We decided to do something for the society and began working on it. Our output was one the cheapest and lightest robots in this category – ‘Manav.’ You will find that robots with similar features as our ‘Manav’ cost you somewhere between 15-20 Lakh rupees commercially – well, we managed to make ‘Manav’ at much lower costs. Vaish and team took all of two months to design, fabricate, programme and test Manav, using parts that were all made in India. Manav’s outer frame is made of plastic, and it was 3D-printed by ‘Buildkart Retail,’ A-SET’s own 3D printing venture. This A-SET wheelchair costs around 2 Lakh rupees at the moment, but Vaish and team expect the government to take notice of this invention and facilitate making it more affordable and easily available to patients across the country. 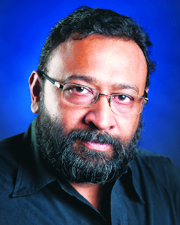 Vaish has built over 40 robots till date. These include football-playing robots, writing robots and shadow robots – a robotic arm that imitates a human’s action. Vaish and his team are also working on a wearable mind-sensor headset that can track a person’s attention span and concentration levels, can read brainwaves, and when synced with a robot can accordingly direct the robot to perform tasks without human intervention. He and his team at A-SET are also working on a smart home-automated solution that can sense human feelings and perform jobs without being told – like opening doors, turning the air conditioning on by sensing an increase in body temperature, switching the TV to a channel of choice, etc. 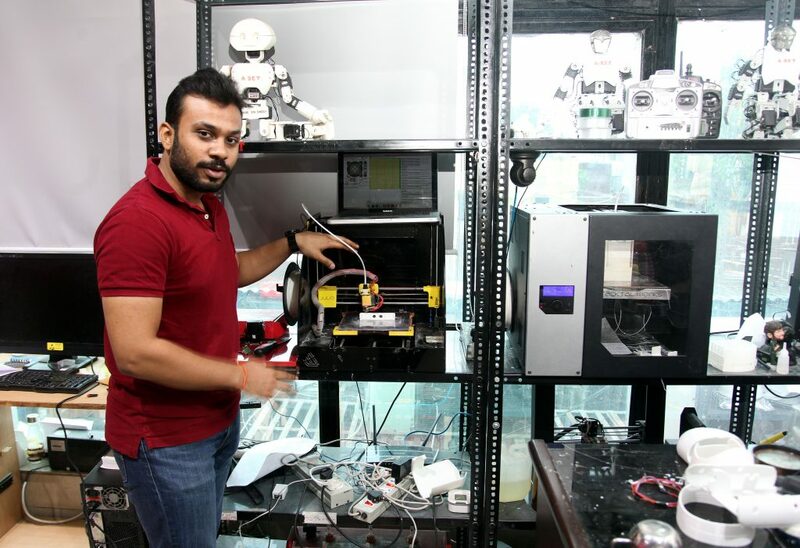 Vaish has for the past three years been working on a life-sized humanoid robot that should soon be available to research institutes in India and abroad. A robot that can work non-stop for 10-15 hours a day and can be programmed to perform tasks that may be hazardous for humans. 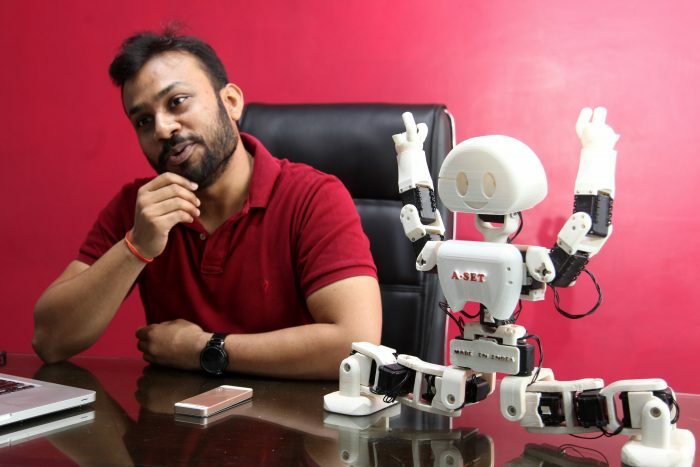 “For example, a person could remotely guide the robot in real-time to carry out tasks at nuclear power plants, or a surgeon in the US could perform a procedure in real-time on a patient here in India using such a humanoid robot,” says Vaish. “End of the day, I would say my ultimate aim is to take robots to every home, to all those people who actually need it. And of course, to make robots more economical, durable and accessible for everyone in the society.” Here’s to hoping he succeeds in his endeavour.